… for Valentine’s Day (or just because). Here’s a candle craft that is easy enough for children to assemble as a homemade Valentine gift for Mom, grandma, or a favourite teacher or babysitter. The supplies are relatively inexpensive and easy to obtain so why not make a couple of Valentine candy candles for the special people in your life. 1. 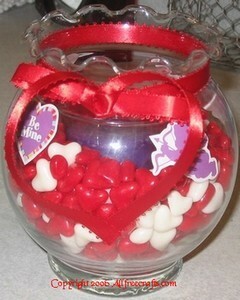 Fill the ivy bowl about two thirds full with red and white Valentine’s Day candy. 2. Place the candle in the candle votive, then press the votive down into the candy so that the candle is nestled right in the center of the ivy bowl. 3. Add four Valentine’s Day stickers to the outside of the ivy bowl, about one inch below the neck of the bowl. Make sure all four stickers are placed an equal distance apart. 4. Fasten a length of 1/2 inch red ribbon around the neck of the ivy bowl and tie it with a small “shoelace” type bow. 5. Glue the two ends of the ribbon together as shown in the photo, with one end of the ribbon glued in place at a right angle to the other end. This will form the sharp point of a heart shape. 6. Put another dab of glue behind the joined ribbon ends; push the ends up slightly to force the ribbon into a heart shape, then glue the ribbon end to the glass of the ivy bowl. If you wish to wrap the Valentine candy candle for gift giving, lightly pack the top with tissue paper to prevent the candies and candle from moving, then finish wrapping as desired.